The switch Sonic is standing next to reveals an idea brought over from Sonic 1, but canned. Clicking the button will make this checkered ball pop upwards and roll down the hill. 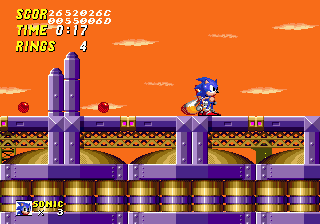 Sonic can stand on it with a little bit of help. 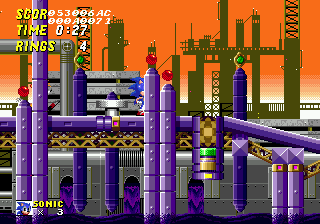 Also, the factory in the background has it's animations the wrong way, making it look like it's sucking up Oil from the Ocean. 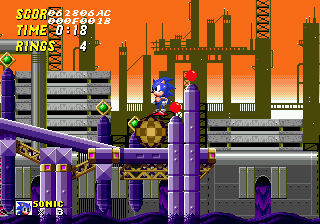 Heres Sonic standing on the checkered ball. There are several points in the level which switch on the rolling balls, all which react the same and don't do a lot. 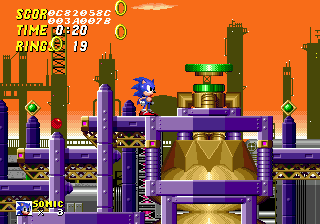 These 'hotplates' work exactly like they do in the final game, but here there are no green flames to push them off. The slick streams are still here, but don't effect Sonics movements at all. These floating platforms are very different. These look like minature UFOs, but the final levitation devices take up the whole width within the purple bars, and are a simple rectangle with some green on it. 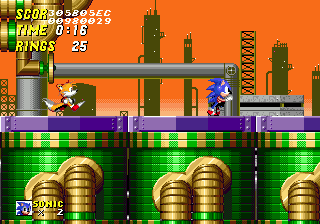 The end of Act 1 leaves Sonic and Tails stranded with no Act clear sign to hit. 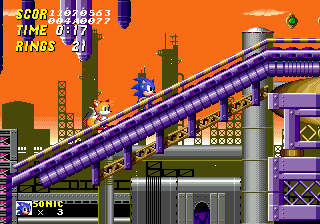 The pipe behind them both which bends at a L turn also does not exist in the final game, only the BETA. The end of Act 2 is even weirder. 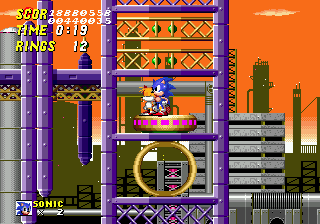 there is a complete lack of Eggman here, only left with a straight platform and no end panel. The sun is different in both how it looks and how it moves. In the Beta [left] it has no animations, and simply sits there. It does not move with the camera, and will only stay above one building. The final [right] has a heat haze animation, and will move with the camera.